I shot a roll of CX 127 Kodacolor-X that expired in 1971 using my Baby Brownie that dates from 1934 to 1941. I’m guessing that the last time I used the camera was at least 45 years ago. I remembered that back then I had to tape the seam where the top meets the body – an outcome of some previous rough handling of this Bakelite camera. 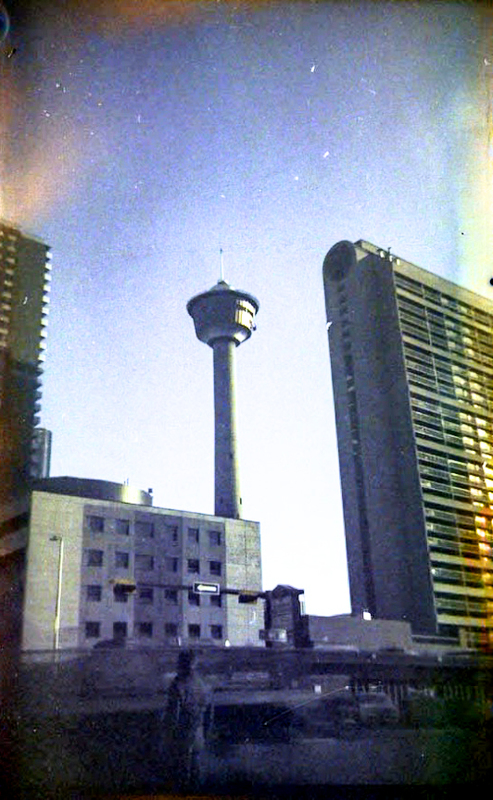 I loaded the film, taped the camera and then headed out of my office in Calgary Canada. This is the first of only two images on the roll of eight that turned out (the second one submitted as “Calgary Memorial Park”). I had this processed by the experts at Film Rescue International. They first developed the film in B&W and then accelerated it to colour. The B&W versions of the two images are in many ways “better” but I figured that since my mother had spent the extra money to buy me a roll of colour film, I would share the colour versions.